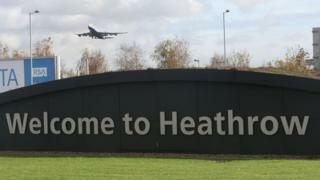 The spokeswoman said Heathrow was working with Air Traffic Control and the Metropolitan Police following the incident. "We continue to monitor this situation and apologise to any passengers that were affected by this disruption," she said. A couple of hours after the first reports of a drone in the skies above Heathrow, it was business as usual in the Terminal 5 departure lounge - in a low blow to Gatwick, one member of staff told me it's because "we're a good airport". Ms Walsh, who was doing a couple of days of work despite being on maternity leave, said she won't get to her final stop in Wales for another couple of hours now that she has missed her train. "It was all calm - frustrating rather than worrying," she said. "I was worried I might have to camp here," he said. He said the problems here and at Gatwick have shown "exactly how to shut a country - this country - down", adding that police need to "just shoot drones down" as soon as they are sighted. Jack Whittle, whose flight to Manchester was grounded, said the aircraft was "freezing" and "babies were screaming everywhere". "Elderly people are getting blankets, but nobody else," he told BBC News at the time. Travel expert Simon Calder said the temporary halting of departures would have a knock-on effect. "They will now be able to start getting away, but all that time you have had arrivals coming in and gates not being available because departing planes haven't gone. It's going to be messy for the rest of the evening," he told the BBC. Mr Calder said Heathrow had measures in place intended to prevent this kind of incident. "Heathrow told me that they had actually provided equipment and personnel to help their big rival Gatwick out during the drone event," he said. John Grant, industry advisor to air travel data specialists OAG, told the BBC it was "almost inevitable" after what happened at Gatwick that there would be "a heightened state of awareness and these types of incidents could possibly reoccur".